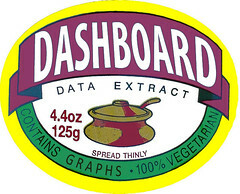 The term ‘dashboard’ currently seems to have a similar effect to marmite, you either love it or hate it. Fortunately it looks like the trend is towards increased personalisation of the way data is presented for both visual and exploratory purposes (an example of this is Thomson Reuters finance system Eikon), so if you don’t like marmite you can have something else instead. One of the reasons I like using Google Spreadsheets is it’s a fairly easy environment to pull data into, provide specific views and share with others. Recent examples of this include the work I did providing a summary of the discussion activity within the open online course LAK13 (btw the recording of the recent ‘Geek Out’ webinar covering this is available from here). 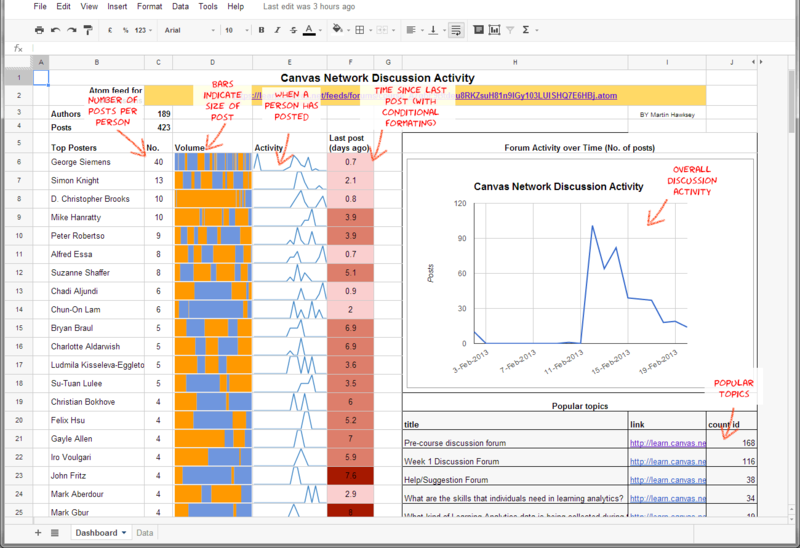 This example takes the existing Atom feed from Canvas discussion boards, which contains all forum posts, and provides some lite summary of activity (shown below – click to enlarge). When faced with a similar challenge for ocTEL it made sense to evolve this existing work rather than reinvent. As previously outlined in the ocTEL course recipe, we use the WordPress platform as a course hub, creating additional functionality using plugins. For the discussion forums we use the bbPress plugin. Like the rest of WordPress, bbPress creates a number of data feeds that we can use for forums, topics and replies. As far as I can tell though these feeds follow the WordPress global reading settings for the number of items available and are limited to RSS2.0. One of the really nice things however about working with WordPress is once you have you basic stack of plugins its easy to customise using your themes functions.php script. And that’s what we’ve done for ocTEL. Using WordPress’ extensive codex documentation we can see it’s possible to create our own feeds. So by adding this custom action in our theme functions.php and including this feed template in our theme folder we have an Atom feed for all our forum activity. With some very minor tweaking of the Canvas example mentioned above I’ve now got an overview of ocTEL forum discussions dashboard. So now we have some insight to the ocTEL forum activity it raises some interesting question. Besides turning the insight into action the questions at the top of my mind are: how do we promote this data endpoint? what other data feeds and formats would be useful? How do we license the data? Your thoughts as always are very welcome. Great post. 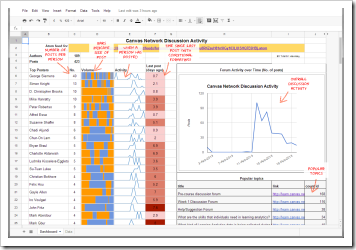 I like the idea of dashboards, and your examples are really useful and stuff that most teachers are familiar with. For learners being able to see this overview of activity is new, useful but perhaps also slightly intimidating. I think we need to spend time sharing and explaining just why these metrics/views are useful which in turn should help to develop new visualisations and integrations of tools like SNAPP which give another (slightly more sophisticated) view of forum activity. The data licence thing tho is crucial. From a learners pov I might not mind you (ie octel course team)annonymising my data on that course, but I might be a bit more uncomfortable with it be used in any other context without me being able to have access to it too (without having to pay for it). Finally found the time to have a play with this to try and dashboard the activity on my recent open Podcasting course. I’m trying to figure out ways to increase engagement to the end of my 1 or 2 week courses, so seeing how activity waxes and wanes would be really useful. The forums have over 40 topics and over 100 replies, so there’s definitely content there, but it doesn’t seem to be picking it up. Do you have any pointers on where to start looking if it’s not picking up the content to populate the feed? in the activity template what happens if you change line 42 to print_r(query_posts( $the_query )); ? I wonder, I’ve put the functions file in the parent theme folder, and the template in the child theme folder. Can’t see that it would make any difference, but I might try it all in the child theme folder. I’ll also install your theme wholesale and see if that works any better. Although, again, I’m not sure why the theme would affect the feed template. Never know though! I’m running on a Multisite setup, and this is a subsite, just incase you think that might make any difference. Thanks for the help Martin, and sorry for the slow reply. I’ve managed to come back to this a few times in the past month, but I couldn’t figure out a way to get it to work with multisite. I’ve exported the sub-site and imported it to a stand-alone wordpress, and it then works fine, so it’s definitely something about the MS setup. Strange. Anyway, all is working well on the stand-alone import so I can analyse engagement with my bite-sized learning tech courses now. Cheers!